The colour red is a very bold and dramatic colour to incorporate into your home but the effort to do so is totally worth it. It is also a great colour for your bedroom as it can truly make a statement and make it look really interesting. These are some really creative ideas to get you started. There are so many shades of red available that you can choose to use but this modern red bedroom is a very stylish example of it. Splashes of dark red are infused with pops of black and cream that makes it look even more dramatic with varying textures for added style. You are sorely mistaken if you think that red can only be paired with neutral colours as they can actually be used with other bright colours as well. 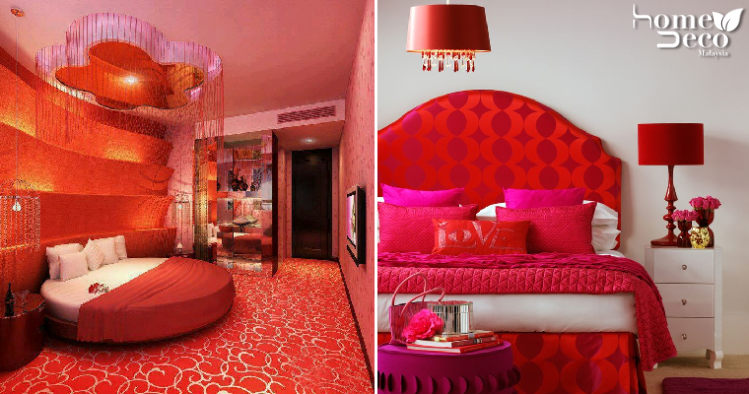 This feminine and girly looking bedroom with fuchsia tones and bright reds has beautiful patterns that make it look even more trendy. This cranberry red room is super gorgeous especially with some of its plush texture to make it look even cosier. The soft grey colour in the room offsets the cranberry and makes it look more fashionable. If you’re looking to add a touch of luxury and royalty in your bedroom then get inspired by this glamorous style. The velvet texture used in this bedroom makes it look even more majestic and impressive. For a different take on a red bedroom, you can consider going the vintage route just like this sensational bedroom here that has incorporated retro elements in its design. Your throwback bedroom will definitely make a statement in your home. Using this orange-red shade in your bedroom makes for a really fun environment and jazzes up a boring space as well. The round bed draped in similarly coloured sheets are gorgeous while it’s the details in the room that makes it truly stylish.